Massive Open Online Courses (MOOCs) are gaining traction all over the world to provide unlimited participation and open access to quality education via the web. The visitors to the top three MOOCs platforms (Udemy, FutureLearn Coursera and edX) are from the United States, followed by visitors from India. This shows the tangible interest in MOOCs in India with their cost effectiveness and potential to reach a large number of learners. MOOCs provide us the opportunity to broaden the access to quality education at all levels. This workshop is aimed to highlight the research in the field of Massive Open Online Courses as they have given Indian academics a better sense of how a lecture could be restructured into short, self-contained segments with high interactivity to engage students more effectively. This workshop will address various issues relating to planning, developing, delivering and managing online courses in the context of higher education institutions. The workshop will help the delegates to understand the role and application of MOOCs to bring the effectiveness in the delivery of education. The workshop will also look at the platforms available for launching online/MOOCs and the problems/challenges involved in the course delivery. Furthermore, the workshop will attempt to develop skills for designing courses and its delivery through the network of individuals and institutions. Explore different ways of designing online and MOOCs. Identify the steps involved in designing and delivering online and MOOCs. Critically evaluate the strengths and weaknesses of online platforms. Developers and other stakeholders involved in MOOCs pedagogy. Role of faculty in blending MOOCs in regular Curriculum. Benefits and scope for teaching community. Registration for persons interested to participate in the workshop will be on a first come first served basis with a maximum limit of 50 participants. There is no registration fee for the workshop. Selected participants will be given free boarding & Lodging in the Guest House. Duly filled in registration forms should be submitted to Dr. Kishor Satpathy at ksatpathy@gmail.com on or before 18 Aug. 2017. Please note that there will be no on-the-spot registration. NIT Silchar is located on the Silchar - Hailakandi road at a distance of about 8 K.M. from the railway station/bus stand. Silchar is linked to the rest of the country by road, rail and air. There are daily flights from Kolkata and Guwahati.Transport facilities like day/night super bus service, are available from Guwahati/Shillong/Aizwal/Agartala/Imphal to Silchar. 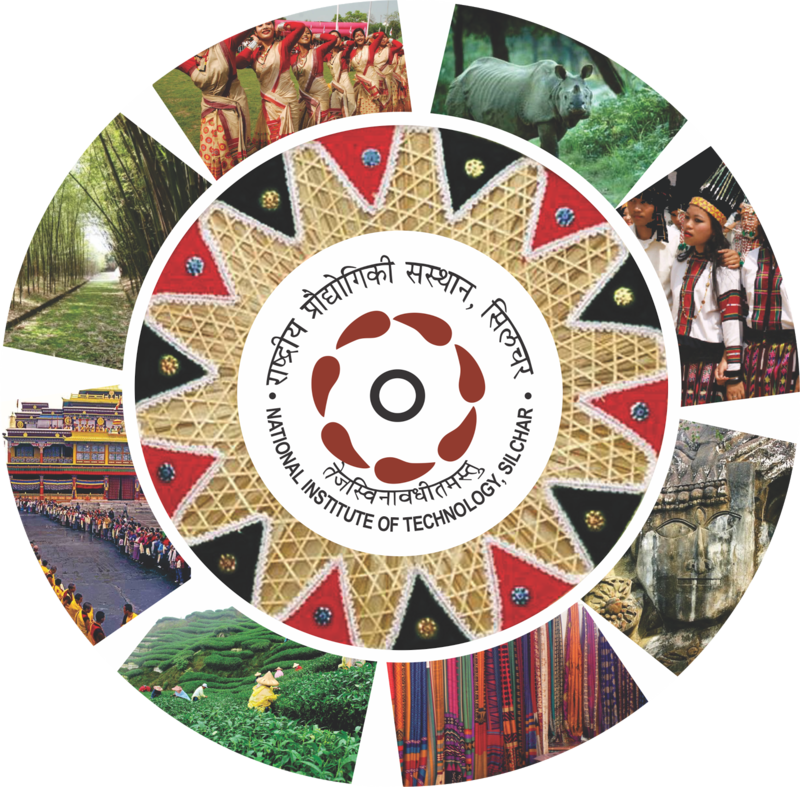 The National Institute of Technology, Silchar (An Institute of National Importance) is one of the premier national level institutions for technical education in North-East India. The institute was established as a joint venture between Government of India and Government of Assam as Regional Engineering College, Silchar in 1967 with the objective of imparting quality engineering education, providing cosmopolitan outlook among students and fostering a spirit of National Integration. This institution has been transformed and upgraded to National Institute of Technology, Silchar with a Deemed University Status with effect from 28.06.2002. The institute has subsequently been made into a fully Government funded institution of India with the Institute of National Importance under the NIT Act 2007. NIT Silchar is situated on the banks of the river Barak and on a sprawling campus spread over 600 acres of land on the outskirts of Silchar. The landscape of NIT Silchar campus is beautiful with natural lakes and hillocks, surrounded by tea gardens. NIT Silchar is a fully residential Institution. The Institute provides courses at UG, PG and Ph.D. level for six Engineering branches namely Civil, Mechanical, Electrical, Electronics & Communication, Computer Science and Electronics & Instrumentation. The Institute also provides PG and Ph.D. degrees in Applied Physics, Applied Chemistry, Mathematics and MBA. The Institute encourages Research & Consultancy works that syncs with the global technical advancements, with special emphasis on the development of North Eastern Region. Various programmes are conducted in the Institute, including conferences, workshops, seminars, invited talks, etc. in collaboration with different academic institutions, R&D organizations and industries. National Institute of Technology, Silchar. Prof. Deepak Garg, Professor and Head, Computer Science and Engineering Department, Bennett University, Greater Noida, U.P. DIAC is one of the best Automation training center in Noida with 100% placement support. We provides practical and in-depth training for the field of Industrial Automation , PLC SCADA, Drives, Motor, Panel, DCS, HMI, Servo by undergoing Hands-on Project Training at DIAC for freshers/working professional. Call @9953489987.